Homeschooling is, when you get down to it, all about learning. 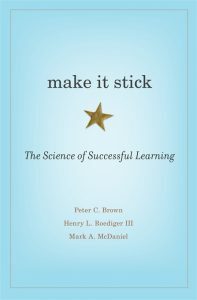 That is one of the reasons I picked up Make It Stick: The Science of Successful Learning—I needed to understand how to make learning work better in our homeschool. Now I am recommending it to everyone. Based on research, this book is full of surprising and practical insights. If you read only one book about homeschooling next year, let it be this one. One of the book’s primary points is that learning sticks better if it takes effort, even though it seems that low-effort methods of studying like rereading and highlighting seem so effective. Retrieving things from our minds, organizing them, and expressing them in our own words—what Charlotte Mason calls ‘narration’—is one of the most effective ways of learning, and it also takes enormous effort. Another point that made me nod my head: we all are poor judges of when we are learning well. Generally we don’t really know what we don’t know, and this is true for our children as well. Testing in the homeschool is not primarily about determining marks; it is about discovering what our children do and don’t know so that we can help them increase their understanding of the subject. Of course, especially in the high school years, marks can be necessary. Review needs to be spaced and never quite stopped if you want to keep knowledge in your children’s brains. Things they are currently learning should be reviewed often, and things they know well only a few times a year. But rereading is one of the least effective methods of review. Recalling, building new connections, organizing the material, and extracting underlying principles are much more effective ways to strengthen knowledge. Every time you learn something, you change your brain. The goal in effective long-term learning is to change the brain permanently. All new learning requires a foundation of prior knowledge, and the more you know the more you can learn. That is, perhaps, why some of the most successful homeschoolers spent so much time as children learning information—from books, sand piles, pets, adults, innocent mischief, and just watching the world—rather than focussing on academics. I was very frustrated at the beginning of this book. Somehow I couldn’t quite grasp what the authors were saying, and each time I almost understood it they moved onto something else, only to come back to each idea from a different angle later on. Then I realized that this was an example of the difficult, interleaved learning that research had proved to be the most effective and that the authors had painstakingly built into the book. Make It Stick ends with a very practical chapter that sums up most of its ideas, but I encourage you to read the entire book if at all possible. Going through the effort will help you understand the concepts thoroughly and make them stick in your homeschool. This book is one of the best I’ve read about learning. Yes, there are other good ones that contribute to the discussion, including Smarter, Faster, Better by Duhigg, Blink and Outliers by Gladwell, Deep Work by Newport, Grit by Duckworth, and, of course, anything by Charlotte Mason. There is research about how being emotionally involved helps learning, and about the effect of intuition and habit and character. Make It Stick, however, is the most practical for those of us involved in the important daily business of teaching our kids. I highly recommend it. 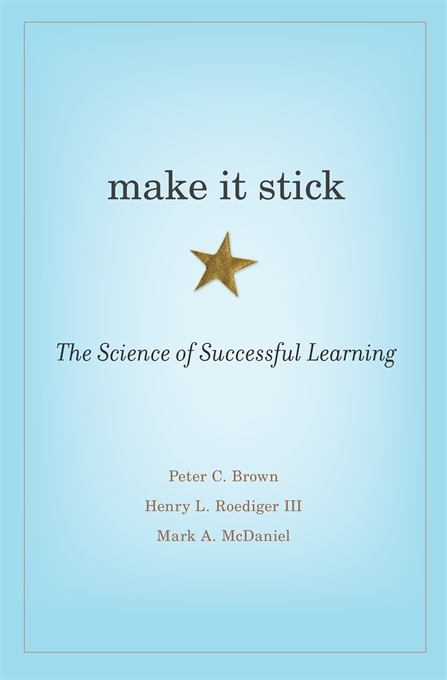 More information about Make It Stick by Brown, Roediger, and McDaniel, as well as related links, is available from Harvard University Press; discussion questions and more are available at the Make It Stick website. Overwhelmed, Underchallenged, Unmotivated, Disobedient, or Just Plain Lazy? Disclosure: I borrowed this book from the library and then put it on my wish list to own. I am not compensated for this review and have expressed my honest opinions. Posted in: 52 Books in 52 Weeks, Homeschool, Homeschool Tips, Reviews, Reviews: Nonfiction. It’s at the OPL!! It is on it’s way to my library as I type! You have no idea how encouraging it is to read how excited you are about this review! Thank you! Just finishing this book. It was well timed. A few take aways – I have instituted weekly math pop quizzes – easily done with Keys to – I am just using old practice tests from books we’ve already completed. It also reassured me a bit about the spiral concept used in Saxon, which is our “spine” math curriculum. I had found it a bit overkill with all the daily review from lessons learned weeks and weeks ago, but maybe John Saxon is smarter than I thought?? I am still puzzling about how to teach/study math. My kids hate the review Saxon provides, but I think it would have benefited the older ones, at least. And it may still benefit the younger ones, if I make up my mind to get the books. On the other hand, there’s The Mathematician’s Lament, an online essay as well as a book in the OPL, that has me scratching my head about math education. There’s also a book by James Nickel on Christian math education. It’s an important but complicated topic. But yes, review is important and pop quizzes seem helpful. Discovery (Key to, NEM) is more mathematical than prescriptive learning (Saxon), but I do not know if that matters.